Dr. Cyrus Wadia (PhD’08) knows about transitions. He has been a policy advocate, business entrepreneur and scientific innovator for clean energy and human welfare prior, throughout and since his time at ERG. He has not only observed but has been part of the change in the world’s switch to solar. His multiple hats and his work on the frontline edges of policy, economics and science made him a perfect fit for the interdisciplinary program at ERG. Currently, Cyrus is the Assistant Director for Clean Energy and Materials R&D at the White House Office of Science and Technology Policy (OSTP). He focuses on advancing innovation and deployment of material systems at OSTP. On leave from Lawrence Berkeley National Lab (LBNL), Cyrus is well familiar with working on novel advanced materials as his research on new kinds of solar cells garnered him the MIT TR35 Young Innovator award. Cyrus makes a new batch of material for PV devices. 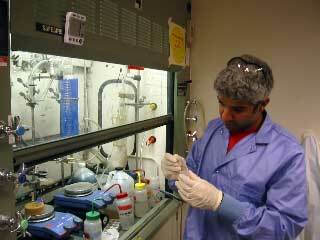 Before coming to ERG, Cyrus’ work interests included both natural resource economics and nanoparticles. He joined ERG’s interdisciplinary program to explore this unique combination. Aggressive targets for photovoltaic (PV) growth, while noble, may be impossible with either traditional silicon based technologies or the emerging chalcogenide based thin films. Rather, there exist other material systems that satisfy both parameters of a least cost per Watt and high theoretical performance. These materials may also be fabricated as low performance alternatives to traditional thin films, such as nanocomposite photovoltaics. Such an approach utilizes far less material, achieve further cost reductions and increase the rate of production without sacrificing total TWh potential. Prior to his doctoral studies at ERG, Cyrus spent six years in the high tech industry as an engagement manager with R.B. Webber & Co. and a senior product manager with AvantGo. Cyrus specialized in launching new technologies to market and completed several successful new product introductions while with AvantGo. Cyrus earned both his S.B. and M.S. in Chemical Engineering from MIT. Cyrus has been advising at the White House OSTP since 2010. He is currently on leave from the Haas School where he is the co-director of the Cleantech to Market Program. He is also on leave from LBNL where he has been serving as both a guest scientist and organizer of Berkeley Lab’s new Carbon Cycle 2.0 initiative.